NYC, 04/18/2019, 2:00PM. A Star Is Born (2018): Oscar Winning Story Of A Musician And A Singer Starring Bradley Cooper and Lady Gaga. Starring Lady Gaga, Bradley Cooper, Sam Elliott. 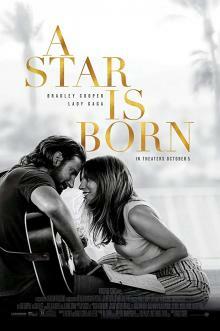 The film received eight nominations at the 91st Academy Awards, including Best Picture, Best Actor (Cooper), Best Actress (Gaga) and Best Supporting Actor (Elliott), and won for Best Original Song. It received five nominations at the 76th Golden Globe Awards, including Best Motion Picture, Drama and was chosen by both the National Board of Review and American Film Institute as one of the Top 10 Films of 2018.